Hillary Clinton's scheduled comments to staff and supporters have been moved from 9:30 a.m. ET to 10:30 a.m.
Mexico's President Pena Nieto said he was ready to work with U.S. president-elect Donald Trump to help bilateral relations, and that the two countries would continue to tighten bonds of cooperation and mutual respect. Pena Nieto was heavily criticized for receiving Trump in Mexico during the campaign, after the Republican candidate called Mexican immigrants rapists and vowed to build a wall between the two countries. "Mexico and the United States are friends, partners and allies and we should keep collaborating for the competitiveness and development of North America," Pena Nieto said on his Twitter account. Trump has said he could tear up the North American Free Trade Agreement (NAFTA), which has increased commerce between Mexico, the United States and Canada, saying that it has killed U.S. jobs. Remi Lariviere, spokesman for Immigration, Refugees and Citizenship Canada, has confirmed that the department's website "became temporarily inaccessible to users as a result of a significant increase in the volume of traffic" on U.S. election day. "Shared Services Canada worked through the night and continues to work to resolve the issue to ensure that the website is available for users as soon as possible." 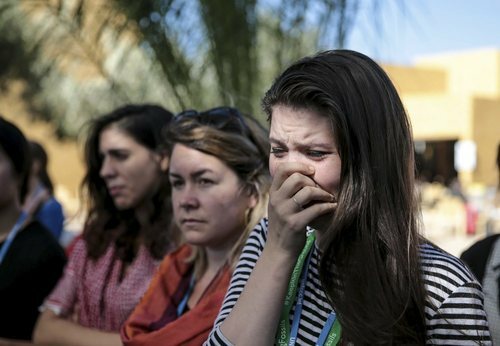 Grim-faced activists at U.N. climate negotiations in Morocco pledged on Wednesday that the election of Donald Trump as U.S. president would not derail global action to curb climate change and deal with its worsening consequences. "It's clear Donald Trump is about to be one of the most powerful people in the world... but even he does not have the power to bend and change the laws of physics," said Alden Meyer, policy director for the Union of Concerned Scientists. As climate change exacerbates extreme weather and other problems including sea-level rise, Trump will have an obligation to protect U.S. citizens, activists say, and could miss key opportunities to create the millions of new jobs he has promised, if the country backs off renewable energy expansion. U.S. House Speaker Paul Ryan will hold a news briefing at 11:15 a.m. ET. Mexico's foreign minister said on Wednesday the country's government would not pay for a wall along the U.S. border promised by president-elect Donald Trump. "Paying for a wall is not part of our vision," foreign minister Claudia Ruiz Massieu told local television. As part of his campaign, Trump vowed that he would build a massive border wall and make Mexico pay for it. Ruiz Massieu said that the government had maintained communication with Trump's campaign team ever since his visit to Mexico in August. "There has been a fluid, daily communication with different members of the campaign," she said. Conservative Party leadership candidate Kellie Leitch issued praise for the Trump win. "Tonight, our American cousins threw out the elites and elected Donald Trump as the next president," she said in a message to supporters. "It's an exciting message and one that we need delivered in Canada as well." 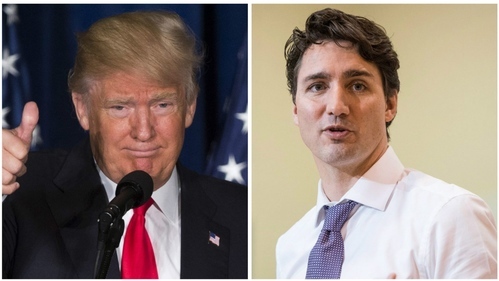 Prime Minister Justin Trudeau congratulates Donald Trump on his election as the next U.S. president, and promises to work with him to bolster trade and international security. The TSX was up 20 points shortly after open. 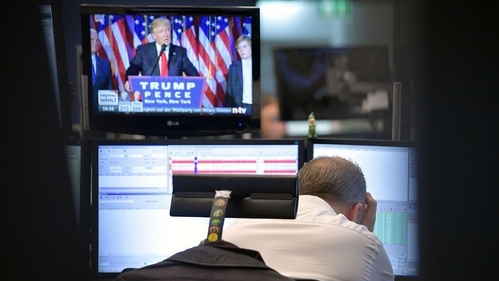 After tumbling immediately following the American election results, global financial markets shook off their worries about a Donald Trump presidency and were slightly higher early Wednesday. Donald Trump's victory in the U.S. presidential election is likely to empower hardliners in Iran who are pushing for global isolation and discourage already wary foreign investors. Republican Trump said during the election campaign that he would abandon the nuclear deal reached between Tehran and six world powers in 2015 that curbed Iran's nuclear programme in return for the removal of international sanctions. His tough stance, in contrast to President Barack Obama's offer of an olive branch to Tehran, could serve the interests of hardliners in Iran. "If Trump adopts hostile policies towards Iran, this will empower hardliners in Iran," a senior Iranian official told Reuters on condition of anonymity because of the political sensitivity of his comments. 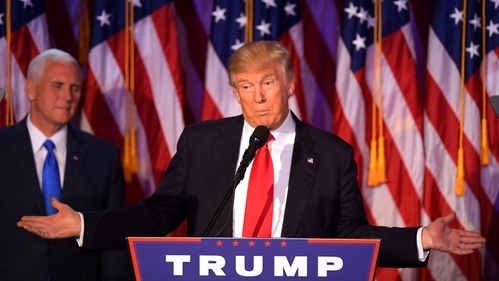 The head of the World Trade Organization congratulated Donald Trump on his victory in the U.S. presidential election on Wednesday and said he would support his administration in ensuring trade was a positive force for job creation. "U.S. leadership in the global economy and the multilateral trading system remains vital," WTO Director General Roberto Azevedo tweeted. "It's clear many feel trade isn't working for them. We must address this and ensure trade delivers the widest benefit to the most people." France's far-right National Front party leader Marine Le Pen congratulated Donald Trump for his U.S. presidential election victory on Wednesday and said she hoped the same kind of upset would happen in France next year. "Congratulations to the new president of the United States Donald Trump and to the free American people!" Le Pen, who will compete in France's presidential election six months from now, said on Twitter. "What happened last night was not the end of the world, it was the end of a world," she later told reporters. "The Americans gave themselves a president of their choosing and not the one that the establishment wanted them to rubber-stamp." U.S. President Barack Obama is scheduled to make his statement on the election results at 12:15 p.m. ET. United Nations Secretary-General Ban Ki-moon said on Wednesday he hopes the administration of Donald Trump will "strengthen the bonds of international co-operation" and described Hillary Clinton as "a powerful symbol of women's empowerment." "In the aftermath of a hard-fought and often divisive campaign, it is worth recalling and reaffirming that the unity in diversity of the United States is one of the country's greatest strengths. I encourage all Americans to stay true to that spirit," Ban said after Trump's presidential election victory. "People everywhere look to the United States to use its remarkable power to help lift humanity up and to work for the common good," Ban told reporters. Hillary Clinton is due to speak in about five minutes. Iran has exceeded a soft limit on sensitive material set under its nuclear deal with major powers, the U.N. atomic watchdog said on Wednesday, hours after Donald Trump - who has strongly criticized the agreement - won the U.S. presidential election. The International Atomic Energy Agency (IAEA) is policing the restrictions placed on Iran's nuclear activities under the deal it signed last year with the United States, Russia, China, Britain, France and Germany. The agreement also lifted international sanctions against the Islamic Republic. The IAEA had "expressed concerns" to Iran over its stock of heavy water, a substance used as a moderator in reactors like the unfinished one at Arak, the agency said in a confidential quarterly report seen by Reuters, adding that Iran's stock was 130.1 tonnes on Tuesday, just above a soft limit of 130 tonnes. Iran informed the agency in a letter received on Wednesday of its "plan to make preparations for transfer" of five tonnes of heavy water out of the country, the report said. Iran also exceeded the heavy-water limit in February, with 130.9 tonnes. Oakland police say they issued one citation but did not make any arrests during a protest following Donald Trump's presidential victory that damaged several businesses in the downtown area. Officer Marco Marquez says protesters damaged five businesses, breaking windows and spraying graffiti. Police say the protest began around 11:45 p.m. Tuesday before growing to roughly 250 people. Protesters also set garbage bins on fire. Marquez says police issued a citation for a vehicle code violation. He says police are increasing staffing in preparation for the possibility of another protest on Wednesday night. The future leader of the Middle East's top foreign ally is, in the words of a Saudi prince, an anti-Muslim "disgrace", openly disdainful of Arab security partnerships, who believes Saudi Arabia would cease to exist for long without the United States. Donald Trump's presidential election victory means he is the man Washington's Arab allies must deal with after his January inauguration, as they seek U.S. help to end wars from Syria to Mosul, manage humanitarian crises and provide jobs for their populations at a time of low oil prices. Trump's campaign tirades against Muslim migrants - the target of Prince Alwaleed bin Talal's comments on Twitter - and against Arab allies who don't "pay" for U.S. support suggest the relationship could be delicate. How far Trump the president will differ from Trump the polarizing election candidate is not clear. The right-wing Breitbart News Network is expanding its U.S. operations and launching sites in Germany and France, its U.S. editor-in-chief told Reuters, as it seeks to monetize the anger and anti-immigrant sentiment unleashed by Donald Trump's successful presidential campaign. The planned expansion is one sign of how the right-wing media landscape is shifting in the wake of Trump's campaign to provide a platform for the more radical views that helped fuel the Republican candidate's shock election victory on Tuesday. Breitbart, whose profile surged when its former head Stephen Bannon was tapped in August to become Trump's campaign chairman, has been a close ally of the New York real-estate mogul in conservative media. A leading voice of the so-called Alt-Right movement -- a loose-knit movement of white nationalists, anti-Semites and immigration foes -- it regularly attacks Republican Party elites, publishes anti-immigrant themed stories and promotes political conspiracy theories. "I think [for] most seasoned watchers ... the writing was pretty much on the wall by 12:30 that the outcome was going to be as it is. So I went to sleep and when I woke up at 5 this morning, I turned the TV on and of course they confirmed. "And look, the United States is an incredibly resilient country, probably the most resilient country in the world and that's why a lot of people admire Americans. I would never bet against the United States and I think that they will adjust to this different kind of leadership and so too I think will Mr. Trump adjust. "I saw him this morning saying, 'I'm the president of all the people.' And I think that's a welcome thing for him to say and one trusts that he will act that way because that is what you discover in these jobs in public office -- that you're there to represent all the people. "He says he's going to work hard to get along with other countries in the world and that's important as well because that is the job of the president of the United States, to be the leader of the free world but at the same time to work with other countries. "So we go forward, you know, it's a democracy. I will continue to focus here on my job which is to make sure that we believe here in bringing people together, in making sure that it is one Toronto that can make sure people who feel marginalized have some opportunity to move forward. "We welcome people from all over the world, of every description, every faith, every colour of skin, every nationality… and that's what we'll continue to do in Toronto. And I trust as president of the United States he'll realize that's really what the United States has a history of doing as well." We're still waiting on Hillary Clinton, who was first scheduled to speak at 9:30 a.m. ET, then 10:30 a.m. ET. No sign of her yet. "Trade may be the least of our worries with a Trump presidency," said Scott Sinclair with the Canadian Centre for Policy Alternatives. Removing the U.S. from free-trade agreements would be difficult to pull off says research fellow.